"This could be made with beef bouillon." 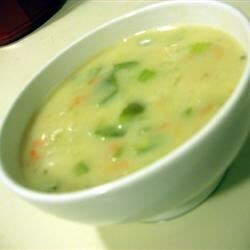 Mix together 4 cups water, bouillon, potatoes, carrots, celery, onions, and green pepper; simmer for 20 minutes. In a separate bowl mix together flour, black pepper, 1 cup water, and milk until smooth and add to the vegetables. Heat through and serve. This is the recipe that tastes so much like mom used to make. My favorite comfort food.